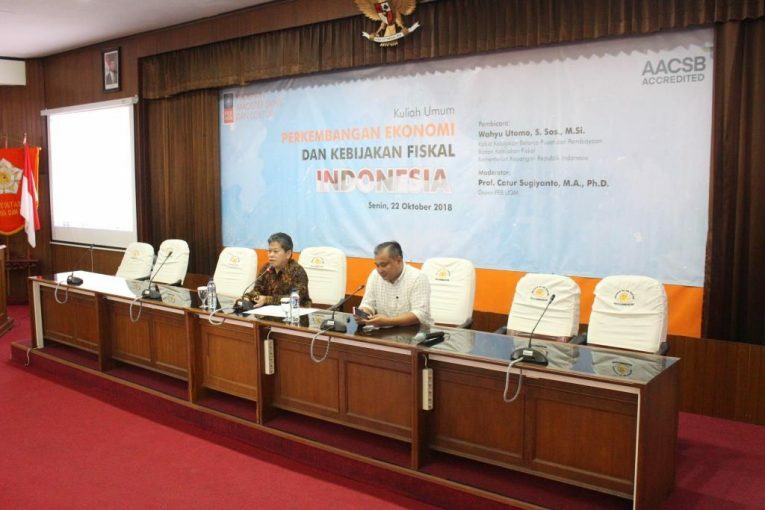 Yogyakarta, October 22th 2018, Master of Science and Doctoral Program, Faculty of Economics and Business, Gadjah Mada University (MD FEB UGM) conducted a public lecture entitled “Economic Development and Fiscal Policy in Indonesia to Realize Welfare”. The public lecture took place at the BRI Auditorium on the 3rd floor of MD FEB-UGM building hosted by Wahyu Utomo, S. Sos., M.Sc. as the Head of Central State Budget and Fiscal Policy Agency, Ministry of Finance of the Republic of Indonesia. The public lecture was moderated by Prof. Catur Sugiyanto, M.A., Ph.D as Director of the Economics Program MD FEB-UGM. The fiscal policy strategy for realizing prosperity is through a healthy and sustainable State Budget (APBN), strengthening the main functions of fiscal policy, and sustainable development. Through a healthy APBN, it will encourage three main functions of fiscal policy to run optimally, which in turn can sustain sustainable development in order to realize equitable prosperity. Wahyu Utomo, S. Sos., M.Sc. in his session generally said that the direction and strategy of Indonesia’s fiscal policy in 2045 had the potential to become a developed country. This can be realized with the prerequisites for infrastructure readiness, quality of human resources, technology readiness, government institutions, regional spatial planning, and APBN must be good. Then in the medium term, the direction and strategy of fiscal policy are towards a just, prosperous, and independent Indonesia by strengthening fiscal management to encourage investment and competitiveness of the nation. In an effort to respond to fiscal challenges, several strategic policies were carried out in 2019, namely revenue optimization, targeted and measurable expansion, infrastructure development, improving the quality of education, mitigating fiscal risks, improving the quality of public services, social protection programs, and improving the quality of health.